Successfully saved Pistachio Lemon Bundt Cake to your Calendar. You can also save the ingredients to your Grocery List. 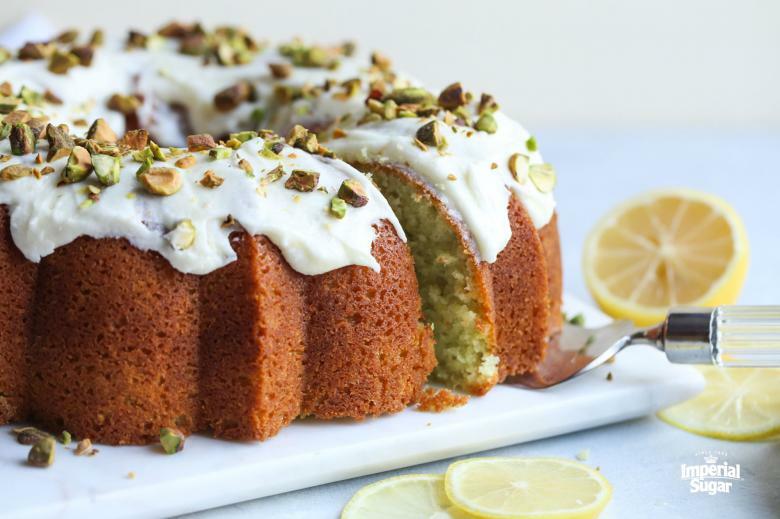 This Pistachio Lemon Bundt Cake is perfectly moist and full of flavor thanks to the addition of pistachio pudding. Topped with lemon icing and crushed pistachios, it’s a great dessert for Easter, St. Patrick’s Day or any Spring celebration. Pistachio Lemon Bundt Cake 3/4 cup unsalted butter, room temperature 1 1/2 cups Imperial Sugar Extra Fine Granulated Sugar 1 (3.4 oz) box Instant Pistachio Pudding 1/3 cup vegetable oil 4 eggs 1 teaspoon kosher salt 4 teaspoons baking powder 2 cups all-purpose flour* 1 1/4 cups milk Icing 1/4 cup unsalted butter, room temperature 1 1/2 cups Imperial Sugar Confectioners Powdered Sugar 2-3 tablespoons fresh squeezed lemon juice Optional 1/2 cup chopped pistachios to garnish *Spoon & Sweep method: Use a spoon to fill measuring cup with flour until required amount is obtained. Scooping measuring cup directly into flour bag will firmly pack flour resulting in too much flour required for recipe.